Looks like spring is taking its time. The last few days we have had Cold frosty night. This has the water temperatures in the mid to upper 40° range. After a warm fast start to this spring, everything has slowed down. We did have a bit of rain this week. We did need the rain, it has been getting a bit dry. As for how much rain we did get, it did help keep all of our and good fishing condition. 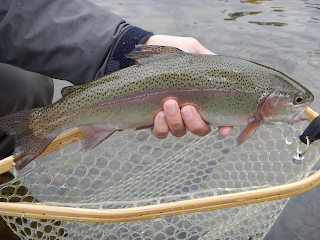 Starting out with the trout fishing, this past week was a good week for the spring hatches. There is good hatches of Hendrickson and Olives, coming off from early to late afternoon. In most cases the fish were on the bugs. Going forward keep an eye out for the start of a light caddis, this fly will be in a size14. Look for Henderson spinner Falls towards evening. This spinner falls will happen when the air temperature is above 60°. Keep in mind that the spinners are very sensitive to air temperature. Just a couple degrees can make the difference of the spinners hitting in the water or going back into the trees. Going into this week, the hatches will continue even if water flows increase. Keep in mind water flows are too high to fish with a dry fly try fishing some bigger nymphs or even a little streamer fishing. At this point I am now officially calling it an end to the steelhead season. Even though you can find stray fish, for the most part it is done. This past Lake Ontario tributary season has been one of the most difficult that I have experienced in over 35 years of fishing tributaries. We have good years and we have difficult years, all part of working in the natural environment. The question is asked why was this past season such a challenge? We can discuss and have this endlessly, but the truth is we will have challenging seasons occasionally. Hopefully easy water an early start to the spring will give the Lake Ontario a strong growing season and we will see a marked improvement in the quality of fishing. As always every year is different and every year has its challenges. Thank you to everyone that fish with me for fishing hard and making it happen. Now to the trout streams.